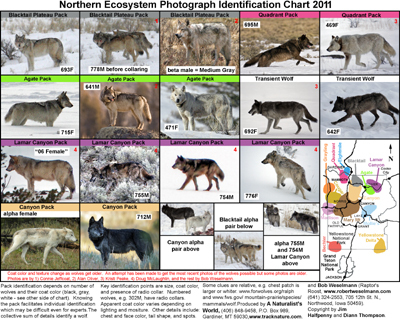 The 2011 update contains pack and individual information about wolves in Yellowstone National Park. 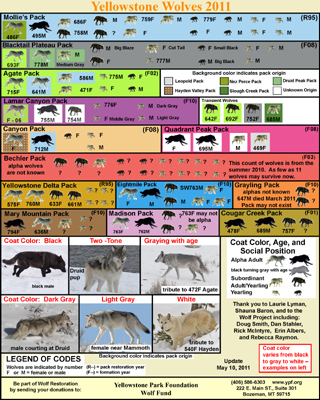 Wolf Identification, color, and pack membership are shown. Printed on high-quality paper and laminated for protection during use in the field. Additional photographs show general color patterns: gray, two-tone, and black. Picture to the left shows the front side. Find your favorite wolf!! Photographs of individual wolves aid in the identification of key pack members. Photograph to the left shows the back side of the chart. PLEASE NOTE THE CHART IS TWO-SIDED WITH PHOTOGRAPHS ON BACK SIDE.